What do you know about this business? the King said to Alice. Nothing WHATEVER? persisted the King. That's very important, the King said, turning to the jury. 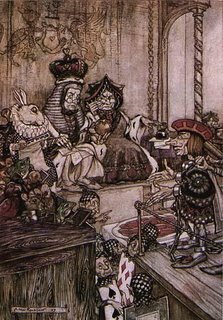 They were just beginning to write this down on their slates, when the White Rabbit interrupted: UNimportant, your Majesty means, of course, he said in a very respectful tone, but frowning and making faces at him as he spoke. UNimportant, of course, I meant, the King hastily said, and went on to himself in an undertone, important--unimportant-- unimportant--important-- as if he were trying which word sounded best. Some of the jury wrote it down important, and some unimportant. Alice could see this, as she was near enough to look over their slates; but it doesn't matter a bit, she thought to herself. Why am I so incensed over the second France 2 trial, when the verdict hasn't even been rendered yet? And why am I close to certain that I know what the verdict will be (hint: the same as the first trial-- victory for France 2), although I'd be happy to be proven wrong? Remember, the issues in this trial are enormous: a famous journalist disseminates a story that's seen around the world, complete with inflammatory photos derived from the video. The story and photos spark many retaliatory murders in the name of the martyred boy. Although many other photographers are present that day at the spot where the event is alleged to have happened, the story is substantiated only by a single tape filmed by France 2's Palestinian stringer Talal (journalist Enderlin was not present). The video doesn't show what it purports to show, although the journalist alleges that it did. Later, forensic evidence contradicts what the journalist has claimed. Now that same journalist and his state-run TV station are suing three French citizens who have accused them---rather mildly, at that, by internet standards--of lying. One would think these trials ought to take more time and effort than the run-of-the-mill traffic violation. And in fact, they have--but just a little bit more. Each case so far has lasted just a few hours. That is peculiar, to say the least. I've been told that in France trials tend to be much shorter than in the US (where, if truth be told, many of them are too long). But the facts of this case, and its importance, should certainly have dictated far more attention and care than I saw demonstrated in that Palais de Justice courtroom last Tuesday. And, in fact, a run-of-the-mill traffic case in the US does generate more attention and care than I saw in that French courtroom. For example, the head judge (who happened to resemble Dennis Miller with a two-day growth of stubble--and that's not necessarily a bad thing) announced early on that, although witness Richard Landes had been slated to show a videotape, this particular courtroom wasn't equipped with a functioning video player, and so it wouldn't be shown. My Eurocentric trolls probably won't like me for making the following contention (but they don't like me anyway, so what the hey? ), but it's my impression that in the dinkiest courtroom in the smallest podunk town in the USA, if something like that were to happen, a functioning machine would either be obtained or the court would adjourn until one could be located. But that was only the tip of the iceberg. I'm certainly not an expert in French law, and I only had a chance to ask a few questions of the lawyer after the trial, but the whole issue of evidence seems to be a very lax one in the French system. In other words, there doesn't seem to be a whole lot of attention paid to evidence at all. Nor to logic, actually. The whole thing played like a version of "he said, she said," only with nifty costumes--black robes and white cravats for the judges and lawyers. blue T-shirts for the gun-toting gendarmes. The trial opened with the judge describing the charges, ascertaining that the defendant was indeed whom he purported to be, and stating the supposedly defamatory words. So far, so good. The defendant was Pierre Lurçat, 39, a Frenchman who is a Jerusalem resident. 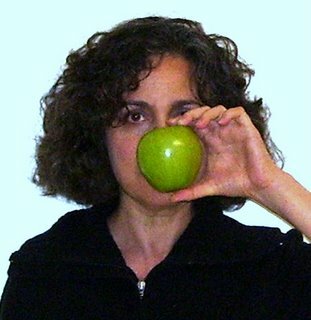 Lurçat is the president of an organization called “Liberty, Democracy, and Judaism,” and is listed as the legal operator of a Web site, www.liguededefensejuive.com, that urged readers in 2002 to demonstrate against “the lies of France 2,” suggesting that France 2 and Charles Enderlin be given an award for disinformation. Unlike Karsenty, who'd been a presence at his defamation trial (the first one, a month ago), Lurçat didn't attend. Neither Enderlin nor any representative of France 2 has been at either trial, and I doubt they'll go to the third one, either. Perhaps Lurçat had read the writing on the wall from Karsenty's trial where, despite the recommendation of the special court reporter (a figure in French courts who represents the interests of the people) that the court find for Karsenty, the judges took the unusual step of going against her suggestion. At any rate, not only was Lurçat a no-show, but one of his defenses appeared to be that he hadn't actually written the words in question on his website; someone else had. Richard Landes, who is one of the few people outside of France 2 who's seen Talal's tape, testified for the defense, based on his study of the al-Durah incident (you can see some of his reasoning at his blog and his website, if you're not already familiar with his work). Although the plaintiff's lawyer asked not a single question of Landes (she appeared, rather, to be engaged mostly in admiring her own nifty high-heeled black boots during his testimony--I had a good view of her from behind and across the rather small courtroom), the head judge seemed to perk up during it. The judge actually showed some affect then--something I hadn't seen him demonstrate till that moment. He seemed interested and concerned. Perhaps he was merely concerned with the fact that the trial was already lasting longer than he wanted it to. But perhaps he was genuinely interested. and genuinely distressed by what he was hearing: missing footage, no blood when the child was supposedly shot, no bullets shown from the Israeli position. In the first trial, this sort of judicial interest (on the part of a different judge) had been taken by many of Karsenty's supporters to actually mean something in terms of the decision. But this time no one was that naive. The prosecutor called not a single witness, nor did she ask one question of either of the two witnesses called by the defense, the second of whom was French journalist Luc Rosenzweig. The witnesses in this courtroom were required to stand and face the judges, so the audience was unable to see their faces from the front. But I was impressed nevertheless by Rosenzweig's controlled outrage. Rosenzweig, a man in his early sixties who is a former chief editor of Le Monde, fairly vibrated with contempt for what Enderlin and France 2 had done, were doing, and might do again. My sense is that some of his sense of outrage came from the fact that he thinks they have defamed the honor of journalism. He mentioned that Enderlin's acts--lying about what was in Talal's rushes, refusing to disclaim footage that even Enderlin himself had privately admitted was mostly staged--go against journalistic ethics. Rosenzweig, like Landes, happens to be one of the few people on earth outside of France 2 employees who have seen the Talal tapes. The court, of course, didn't see fit to count itself among them; shockingly, the tapes have been released neither to the court nor to the public. I could not get a straight answer from anyone as to how the trial was able to proceed without the court or the defense compelling a viewing of the tapes. But perhaps the attitude towards the missing/broken video machine is a clue--the French court simply does not care about evidence, the mainstay of our legal system What does it care about? As best I can tell: power, prestige, and reputation; and saving time, money, and effort. It's a bit like another of my favorite trials (the source of the excerpt that began this post): that of the Knave of Hearts in Alice in Wonderland, where Alice muses at the outset: I wish they'd get the trial done, and hand round the refreshments! One of the highlights of the trial--in fact, it may have been the highlight of the trial for me--was when Rosenzweig snorted, “I've said a lot worse [than Lurçat did] about Enderlin lying, and he never went after me! Enderlin lied repeatedly in the affair.” Rosenzweig was emphasizing not only that Enderlin is a liar, but that Enderlin and France 2 have been very careful in their choice of targets; I think I'm safe in predicting that they'll not be coming after Rosenzweig next. No, it's pretty clear they want these trials to remain low profile--and in fact, until now, they have.